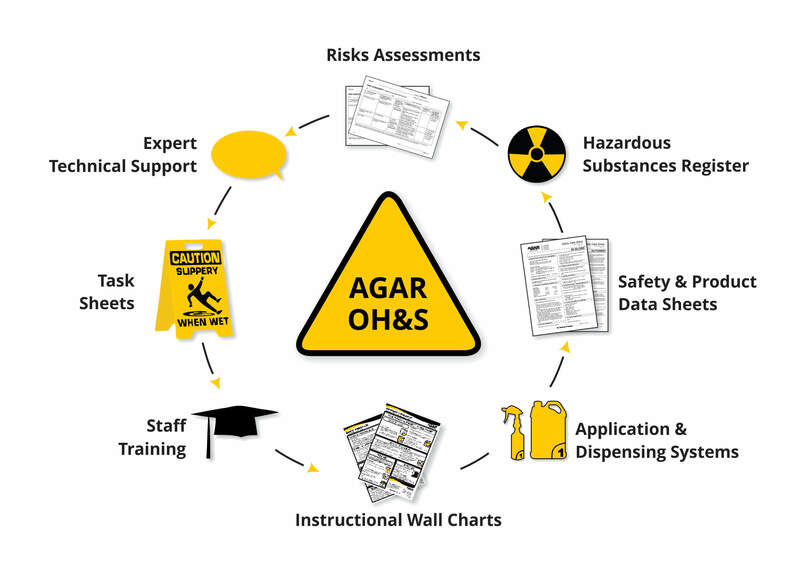 Impress your clients and get covered with Agar’s range of OH&S support material designed to assist your business in complying with the Occupational Health and Safety Guidelines and Government regulations. Agar’s cleaners’ rooms are set up in accordance to OH&S guidelines with risk assessment folders, Safety Data Sheets and cleaning charts. All chemicals and decanting bottles are labelled correctly and all dispensers are installed with clear user instructions. A range of equipment is also available for purchase to ensure that cleaning supplies are stored neatly and safety. Clients have Agar’s Chemical Awareness Training available to them for their cleaning staff to complete either online or onsite. Ongoing technical support is available to all clients to assist in problem solving and product application. To find out more information about Agar’s OH&S support please contact one of our offices in Melbourne, Sydney, Adelaide or Brisbane.